Key Staff Team — Clean Office, Inc.
Delmay Leiva was born in El Salvador but moved to the United States when she was young. She has an AA in Computer Information System and has had most of her work experience in the hospitality industry. She strongly specializes in benefits and office administration, and ADP payroll administration. One reason she particularly enjoys HR and the challenges that go along with it, is the opportunity to connect with people. Diana joined the CleanOffice team in 2015 on a temporary assignment in our Operations Department as an Administrative Coordinator. 3+ years later, she is now using her organizational skills to support our Human Resources Department and is now the HR Administrator. With our 350+ member workforce (and growing! ), Diana’s ability to juggle projects, organize and maintain compliance is a key to our company’s success. Diana has a Bachelor’s degree in Criminal Justice and is currently working on her SHRM Certification. Her goal is to continue making a positive impact on the organization, and she loves her job! Jorge Yepez is a graduate of the Universidad Nacional De la Amazonia Peruana in Peru where he attained degree in Economics and Administrative Management. Jorge is fully bilingual in English and Spanish and has over 14 years of experience in the building-services industry. He is an 18 year resident of Northern Virginia and currently resides in Springfield. Rocio originally joined CleanOffice as a General Cleaner at a local university. Based on our commitment to “hire from within”, Rocio applied for a newly created position to support our growth. She has a strong understanding of all aspects of commercial cleaning methods and brings a ready-to-serve attitude to work each day. .
Roy Maldonado was born and raised in Santa Cruz, Bolivia. He has eight years of broad industry experience including Retail, Health Care and Commercial Building Janitorial Services. In his current role, Roy's responsibilities include managing the Specialty Team, Roving Porter as well as Porter Plus accounts. Brad Buchner’s main responsibility is to grow CleanOffice's PorterPlus accounts. Brad graduated from James Madison University in May 2016 with a Business Administration degree. In his spare time he enjoys tennis and golf and spending time with his dog. In addition, he's an avid DC sports fan. Edgardo comes to our PorterPlus Division with 20+ years of experience in all aspects of commercial janitorial services. As an Area Manager for our PorterPlus Division, Edgardo provides day-to-day oversight of our accounts in Eastern Region of the DC Metro Area. Edgardo also serves as a Project Manager on many of our Special Projects and oversees projects that include floor work, carpet cleaning and pressure washing. 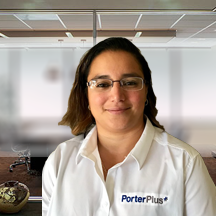 Sandra oversees the day-to-day operations of our PorterPlus Division. In this capacity, she utilizes her experience and leadership / management skills that she has developed over her career which has focused on providing janitorial services to facilities of all sizes. Gladys was born and raised in the DMV area. She received a BA in Medical Assisting, but most of her experiece has been related to providing administrative support to clients and operational staff. Gladys joined the CleanOffice staff in December 2016. In her spare time Gladys likes to read, listen to music, sing, sports and she's very involved with her church. She is also her daughter's #1 fan in soccer and gymnastics. Aly joined our staff in December 2018 and is responsible for recruiting. She is from Cuba and her professional background is in telephone sales. In her spare time, Aly enjoys the outdoors. Maria was born in El Salvador, and came to the United States after completing high school. After spending a year in California, she moved to Virginia to join other family members. Maria has been with CleanOffice since 2005, and has handled a variety of positions on our Operations Team including Day Porter Supervisor and Evening Site Supervisor. Maria was recently promoted to an Evening Area Supervisor role in December 2018, and helps to support many of our Tier 1 Accounts in Western Fairfax County. Maria is a true leader and professional in our industry. Jorge brings 15+ years of corporate commercial cleaning experience to CleanOffice which he will use to support our Tier 1 Accounts in Western Fairfax and Loudoun Counties. In his free time, Jorge enjoys spending time with his family, and frequently travels to North Carolina to visit with his extended family.